CAPTION: Joyce Mollohan was announced as the 2015 Unsung Hero at the Teacher Appreciation Banquet. 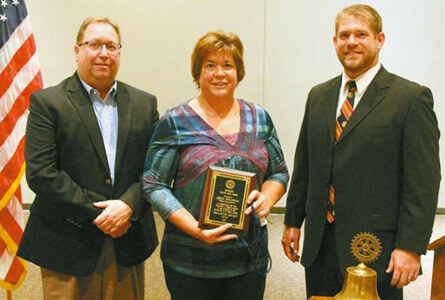 Mollohan is pictured (middle) with Chillicothe R-II Superintendent Dr. Roger Barnes (left) and Chillicothe Rotary President, Jeremy Clevenger (right). Dr. Neil Nuttall was the guest speaker at the annual Chillicothe Teacher Appreciation Banquet Thursday evening at First Baptist Church. Nuttall is the president of North Central Missouri College and is currently in his 44th year in the education field. During his speech, Nuttall talked about what it means to be a great teacher and the soul of education. "As educators, if we measure ourselves based solely on test scores, we have lost our way," Nuttall said. He said the perfect role model for teachers is Jesus Christ because "he was the master teacher." He said a master teacher wants his students to be at his level and beyond. He wants his students to follow his example. A master teacher wants to "teach students to get along without him... the goal is to launch, reach out and grow," Nuttall said. The NCMC president also talked about how sometimes teachers are the only calmness and stability in a student's life, and like Jesus, teachers should be a harbor for those conflicted students. Also like Jesus, teachers should strive to use their creativity to carry out lesson plans, Nuttall said. To pull a lesson plan together with creativity, teachers must have "that burning desire as a master teacher to get that lesson through to those students." Master teachers are also patient and sensitive to the needs of others like Jesus was with his disciples. The most important thing a master teacher must have, Nuttall said, is servant leadership. "You can't do it (be a master teacher) if all it is, is relying on a paycheck," Nuttall said. At the end of the evening, the 2015 Unsung Hero Award was announced which went to Joyce Mollohan of Grand River Technical School. President of the Chillicothe Rotary Club, Jeremy Clevenger, read Mollohan's biography written by GRTS Director Jayme Caughron. "Initiative is doing the right thing without being told," Victor Hugo. Hugo's definition of initiative aptly describes this year's Unsung Hero," Clevenger read. Mollohan has been with GRTS for 17 years and, according to Caughron, "has served our school in countless ways, always taking the initiative to do whatever it takes to help our students, staff, school and community." Mollohan taught high school and adult students for eight years and was also an active adviser at GRTS. She even acquired a license to drive the school bus to events and then eventually served as a substitute driver frequently for the entire R-2 district. "Our 'hero' has a knack for seeing things that need to be done... and then doing them... sometimes before anyone else even realizes they need to be done," Clevenger read. Caughron explained that Mollohan is always the first to volunteer to help no matter what the job and is mechanically-inclined, 'crafty,' and has the ability to fix anything. Mollohan can do anything from running a backhoe and fixing a water line to upholstering office chairs. "We have yet to find a task our hero can't do," Clevenger read. Nine years ago, Mollohan assumed a different role at GRTS - one with unique responsibilities - the duties of both vocational resource educator and coordinator of the GRTS student management system. Caughron explained that either job by itself is demanding, "but it takes impeccable time management skills and a commitment to ongoing professional development to accomplish both." Caughron said though Mollohan is no longer in the classroom on a daily basis, she still provides GRTS students with "academic support relative to their technical programs and serves as a resource between technical teachers and 16 sending school administrators, parents, and students; and monitors GRTS students' progress and communicates that progress to parents and sending school counselors and special ed teachers." Mollohan coordinates the GRTS student management system. She compiles data/accountability information required for grants as well as core data for the Department of Secondary and Elementary Education. She also "assists with presentations, recruitment activities, and enrollment of GRTS students and is a valuable member of the GRTS Pre-Employment Preparation committee, assisting students with a number of career development activities, including the preparation of resumes and application letters and guidance in preparing for job interviews, always stressing the importance of good work ethic and communication skills," Clevenger read. Mollohan grew up in Chillicothe and graduated from Chillicothe High School while also earning completion certificates in both agriculture and business at Chillicothe-Area Vocational School. She earned her Bachelor's degree in business administration/accounting from Missouri Western and worked in industry for 13 years, 11 of those with SEMCO, Inc. She went back to college and earned certification to teach business education, graduating from Northwest Missouri State University with a master's degree in vocational business education. She is married to Mike Mollohan. They have three children: Daughter Jenee Moore and husband Jared of Excelsior Springs; son Jeff and wife Kylee of Meadville; and daughter Jayce of the home. Joyce has two grandsons, Colson of Excelsior Springs and Parker of Meadville. She has one granddaughter, Piper, of Meadville. "Tonight, we honor someone who always works quietly, competently, and efficiently behind the scenes and without recognition. Tonight we honor Joyce Mollohan," Clevenger read.